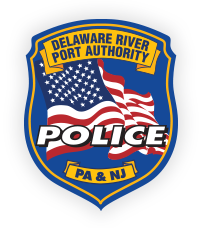 The Delaware River Port Authority Police Department is responsible for protecting life, property, and public assets spread across an extensive area, including the four Delaware River toll bridges and the PATCO High Speedline with its 13 stations. Beyond these obvious responsibilities, the department patrols and secures DRPA/PATCO property on the Pennsylvania and New Jersey highways leading to the bridges; parts of the municipalities located at the bridge landings (including Philadelphia and Chester, Pennsylvania, and Camden, N.J.); and the Delaware River waterway itself. As a bi-state agency, the Public Safety Department of the Delaware River Port Authority faces special challenges. The department provides coverage 24 hours a day, 365 days a year, and handles more than 80,000 calls for service per year. DRPA and PATCO facilities border many neighboring cities and towns, so the department works in conjunction with departments from local jurisdictions, including Philadelphia and Chester in Pennsylvania, and Bridgeport, Camden, Gloucester City and Pennsauken in New Jersey, as well as the state police in both states. In addition, it works with federal law enforcement agencies such as the Coast Guard, the FBI, and Homeland Security. The department also cooperates with other local, state, and federal agencies. For instance, the department’s Commercial Vehicle Unit (CVU), which inspects trucks crossing the four Authority bridges, works with the U.S. Department of Agricultural to inspect refrigerated vehicles that transport meat, seafood, dairy products, and produce.